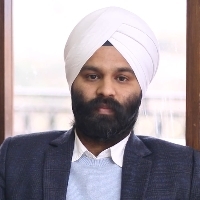 Manmeet Singh Chadha graduated in commerce and went on to do masters in Economics. He attended winter school in Delhi School of Economics. He has done a course in management from London School of Economics. He did his internship at Planning Commission of India. He has worked at RMS as Business Risk Analyst and as Risk Management Consultant at Inductis. He is Strategy & Operations Head at Nuts for Cuts. Economic consulting is the practice of providing organizations in the public and private sector with information to improve their performance and policies, primarily through the use of applied economics, mathematical economics, economic impact analysis, and forecasting across a broad spectrum of issues. "After graduating in commerce, I went on to do masters in Economics. I also attended winter school in Delhi School of Economics. I have done a course in management from London School of Economics. I did my internship at Planning Commission of India. I have worked at RMS as Business Risk Analyst and as Risk Management Consultant at Inductis. I am Strategy & Operations Head at Nuts for Cuts."